Home > Life	> We’re Here! 6 Americans Invade Londrina. We’re Here! 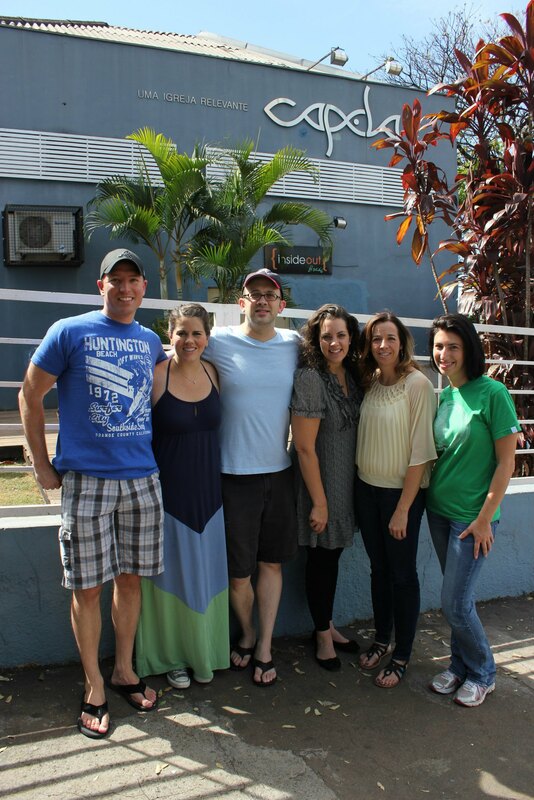 6 Americans Invade Londrina. We arrived in Londrina this morning around 1:30 AM their time (they are an hour ahead of us in Atlanta). I wish I could say all of our luggage arrived with us, but we weren’t as fortunate – out of 8 checked bags only 3 made it on the flight with us. The rest are supposed to be arriving at the hotel for us sometime later this afternoon. Two of our new friends at Capela met us at the airport and brought us to the hotel early this morning. So far today we have had lunch with Pastor Paulo, his wife Kelen, their daughter Luiza, and their son David. Afterwards we went to the church to see them rehearse for Kid+ (their version of KidStuf) and helped them set up for the service tomorrow, as Paulo will be starting a new series called “Masquerade” (based on the book TrueFaced). This evening will be meeting with Saulo to find out more details about the Singles Environment, Lounge Capela and we will help them set up for the event. After Lounge Capella tonight, we will probably be grabbing supper with some of the singles from the church. Tomorrow morning is Kid+ and then tomorrow evening is the service (the only have one service at this time). It has been great to see old faces and to meet new ones as well. Unfortunately most of us didn’t get to bed until around 3:00 AM so we are very tired from all of the traveling, but we wanted to let you know we have arrived safely. Thank you for your continued prayers and support!